There is a goal to have twenty million electric vehicles on the road around the world, by the year 2020. This may sound like a lofty vision, but plans have been in the making for quite some time and the International Energy Agency (IEA) has put out a report book covering some of the most progressive cities. The IEA publication, entitled EV City Casebook: A Look at the Global Electric Vehicle Movement, makes an assessment of the various global EV projects to assist vehicle manufacturers, utilities, mayors, urban planners and any of the others that are stakeholders in locating best EV practices for their own cities. A variety of locations are examined, from the dense populations of Hamburg and New York to the smaller areas such as Goto Islands off of Nagaski. There are the open vast metropolis areas like Los Angeles or the five-city combination of BrabandStad. Each area has a different approach with many options. EVs are being used and examined for taxis, mass transit, short-term car rentals and to create data traffic systems. While cities many often lead by example, using and buying EVs as municipal fleets can also lead to infrastructure changes such as special road lanes. Some of the programs involve subsidized vehicle purchases that are direct, while there are others that are incentive-based. Many of the programs utilize recharging via financial assistance, individual stations or they may have both. The cities that are considered pioneers in these projects have to show what works, what lessons are learned and need to have around thirty percent usage for a return on investment example. The lessons and information shared in the handbook demonstrates that any location, of any size can institute an electric vehicle program to reduce carbon emissions and add to the carbon footprint. Are We Ready for Renewable Electricity? Posted on July 1st under Renewable Electricity. There have been some articles in our local paper (online) about starting an electric vehicle program for our local bus system. Also heard about the school system buses being slowly changed over to electric vehicles. That’s going to mean we will have more charging stations in the area, which just might jump start the rest of us. Electric vehicles are the wave of the future and we need to move on this now. The only way this can be done is if the government organizations do it first and people get used to seeing them as part of their every day lives. Once they see the charging places around their towns, they will have confidence in looking into the cost. The supply and demand theory will then bring the price of electric cars down as well. 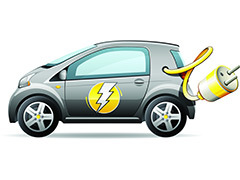 I am really hoping they start an electric car program in our area. I have seen some on the streets already, but those are private citizens. We live in a valley, and while not a high population, the car exhaust has a tendency to settle and not move, until we get a good storm. The town has grown, but the smog can get real bad in the summertime.